Rubenerd: We should get ebook versions for free! We should get ebook versions for free! My home is back in Singapore and I'm studying in Adelaide, and in both places over the years I've collected huge collections of computer books, like these ones! Computer books are bulky and heavy just by themselves, so carrying a few dozen of them between cities in luggage is completely out of the question. What I need are ebook versions. 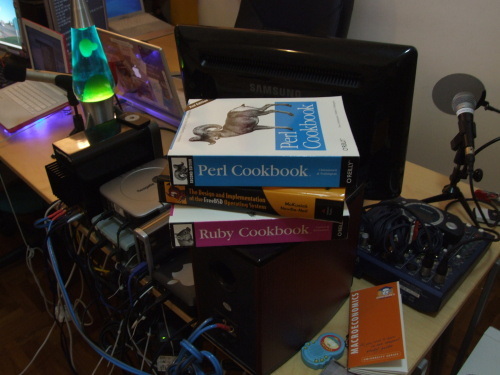 What bothers me is if I really wanted to, I could simply fire up a bittorrent client, aim it at a torrent for a bootleg PDF or EHF copy of a book and download it in a few megabytes; right there on my screen I could have a copy of the Perl Cookbook or Oracle SQL for example. I wouldn't do this of course because the books are available to me in dead tree form at bookshops for sale and it'd be copyright infringement. If we leave aside the knee jerk legal response though, consider the ethical question. If I've legally purchased a copy of a book, is it okay for me to then download a copy of it? I think most reasonable people would say yes, but the law certainly says no. Or does it? When I go to the shop and purchase a copy of a piece of software, I'm buying a licence to use it; am I not doing the same thing for a book essentially? The problem is, the closest we have to a legal avenue for electronic forms of commercial computer books is the Safari Books Online service of which I've been a member for many years. Unlike a traditional book shop, you purchase credits which you can use to download chapters from books, so if you want a whole book you need to spend all your credits on it. It gets messier. If you enter the code from a paper book you bought in the real world, instead of being given free access to an electronic version of the book (which I assumed it would do) you're given extra credits you can use to download chapters as described before. Technically you could use those credits to download chapters from the same book you have in the real world, but there isn't enough and you'd end up spending extra to have a full electronic copy. Welcome to the 21st century. Call me naive, but it's my belief that if I purchase a book (especially technical documentation) I should be allowed to download an electronic version as a value added feature rather than getting watered down chapters in a confusing format. Heck with the cost of flash memory thesedays they could even include a SD card or thin memory key in the book with an electronic copy too. When I'm buying a book I'm paying for the distribution of this huge, lumbering hunk of paper and glue that had to make its way from some remote publishing house, but I'm parting with my money to get it for the ideas printed in it — a licence for the ideas if you will. It would cost publishers virtually nothing to distribute PDF or other electronic forms of this book that would contain the same ideas. Whaddya say OReilly? Developers Library? APress? Help a brother out? Newer post ← #Anime Puhi~ Puhi~!